National Cartoonists Society members have nominated the top five finalists for the 2017 NCS Reuben Award for “Outstanding Cartoonist of the Year”. 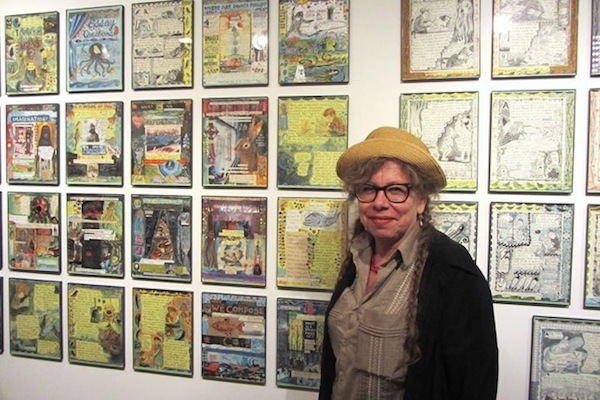 Ballots have been sent out to all voting NCS members this week, and the Reuben Award will be presented to the winner at the 72nd Annual Reuben Awards dinner on May 26th in Philadelphia, PA.
[Art Faculty] LYNDA BARRY is a cartoonist and writer. She’s authored 21 books and received numerous awards and honors including an Honorary Doctor of Fine Arts degree from University of the Arts, Philadelphia, the Milt Caniff Lifetime Achievement Award, two Will Eisner Awards, The American Library Association’s Alex Award, the Washington State Governor’s Award, the Wisconsin Library Associations RR Donnelly Award, the Wisconsin Visual Art Lifetime Achievement Award, and was inducted into the Will Eisner Hall of Fame in 2016.